This is the Freedom and Fireworks edition. Happy 4th to all my American friends! 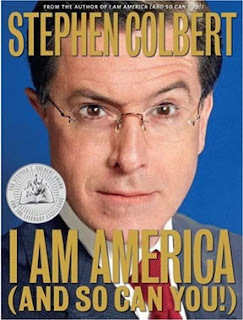 If you haven't discovered the greatness that is The Colbert Report, or even if you have, you should most definitely click aggressively to get his book, I Am America (And So Can You!) My favorite chapters are Immigrants: No Way José and Religion: Accepting Jesus as My Personal Editor. It's also an award-winning book - "Stephen T. Colbert Award for the Literary Excellence." If that's not convincing, it spent 24 weeks on the New York Times Bestsellers List. Spoiler alert! Animal is adorable. I miss talented and sassy iwannadancewithsomebody Whitney. I also miss crackiswhackwhereisbobbby Whitney. I'm looking forward to her new album out in September and the first ballad is written by R.Kelly. Wait, what? Anyway, let's listen to quite possibly the best rendition of The Star Spangled Banner ever.